This book got off to a slow start. But the writing is lyrical and poetic and will draw you in. Margaret Kerr is not particularly likable. And neither is Donald, Elizabeth's husband who cheats on her many times over. 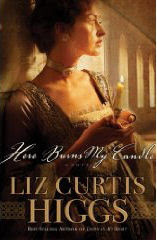 Elizabeth saves the day, however and you won't be sorry you invested your time in this book. Well worth the read for the glimpse of hope it offers, especially if you like literary-type fiction. I'm giving away a copy to one commenter on this post. My blog comments are moderated, so don't worry if the comment doesn't show up right away. I'll get to approving it just as soon as I have a moment. :) The drawing will be held next Monday, April 5th. Oh, and I was given a copy of this book for free. I tried to demand that they pay me $5,000,000,000 to write a top notch review, but Waterbrook was having none of it. So I didn't get paid a dime. But I'm still giving a positive review of the book.